It seems like evertime you turn around Ghostface is hitting the market with some new product. The thing is, it's all good. His last album, 'The Big Doe Rehab', hit the shelves on 12/4/07 and was heating up the winter. Now that spring is on the way, Ghost is back with another full length called 'The Wallabee Champ'. This time around its a collection of rarities and unreleased tracks, but don't let that keep you from spinning this. In fact, you should grab this up before it gets pulled because theres some samples on here that I can't imagine are cleared, including 90% of 'A-B-C' by the Jackson 5. True Wu aficionados might recognize a track or two from some previous J Love mixtapes, but this record is sequenced well and flows from top to bottom. It's always good to hear from Ghostface as he is one of the most clever, sharp lyricists in the game and he keeps it interesting at every turn. I rip their guts out like a hysterectomy" - P. Tone. 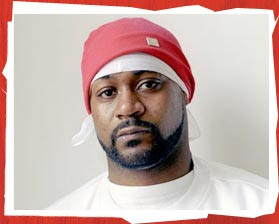 On the subject of Ghostface Killah (a.k.a. Pretty Toney) product, theres a few items that deserve a mention. -The World According To Pretty Toney - BOOK! Thats right, a Ghostface book. This book is amazing. The people I have showed my copy to have said that it might be the greatest book ever. It's advice on life from Ghostface himself. It's sort of like a self help book and a book of quotes written with a healthy dose of comedy and amazing, surreal photos from Dave Hill. He drops wisdom on all y'all smart dumb cats. Oh, did i forget to mention that each pages quote is acted out by none other than 'Ashy Larry' actor Donnell Rawlings. AND, to top it off, it comes with a CD of Ghostface laying it down verbally. Cop this book, you will be a better person for it. The book was based on a series of commercial bumpers that were run on MTV2 a while back. 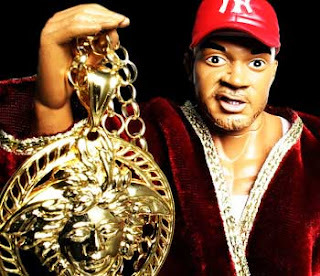 Ghostface Killah Doll collection fund? but I'll be damned if i don't want it. Ghostface is mad prolific. who does he think he is Justin Broderick ? Dave - I think I know what we can get Tom for a wedding gift. His lady will be cool with that, right? At least the doll isn't $500 anymore. I wonder how good the mixtape that comes with it is. Also worth looking forward to: Pretty Toney's cameo in the upcoming Iron Man movie.